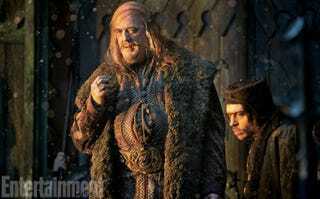 Entertainment Weekly just released a collection of new Hobbit 2 images. Including one particularly interesting shot of Stephen Fry with an epic hairstyle. Just call him Stephen Fry: Master of Laketown, and the Comb-Over. Plus look who learned how to do the fishtail braid: Legolas!